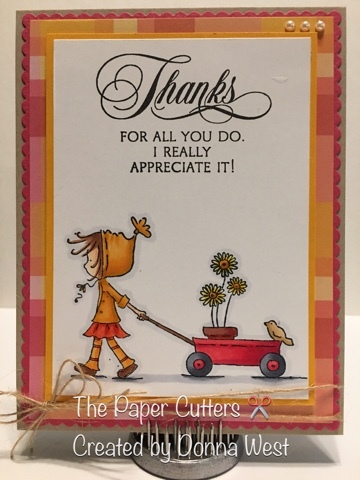 The Paper Cutters: Little Red Wagon Challenge #377- Thank You! Little Red Wagon Challenge #377- Thank You! Hello again! This week I am hosting our challenge at Little Red Wagon. The theme is Thank You! Let's see all your projects sharing some thanks! Here is a link to the Little Red Wagon blog. I will post my favorites there next Tuesday. For my card I used a Stamping Bella stamp called Ramona and her wagon. The words are from a Penny Black stamp set called Special Thoughts. I colored with my Copic markers this week. Lovely card! Such a super sweet stamp! That image is simply darling! Such a fabulous card design too! So cute! I've not seen this stamp before. Thanks for this challenge, I really need more thank you cards! So cute. I really like the bright colours. Thanks for a good challenge. Hugs, my friend.